Oh, my gosh. This is Romeo and Juliette, isn't it? Without the playing dead business. The basic set-up here is that Katie's father is the Republican Presidential candidate and Drew's mother is the Democratic candidate. Katie is totally into politics and has often had a part in her father's campaigns. Drew has never been interested. In fact, his mother's political aspirations are a bit of a trial. Needless to say, these two get together. Now the politics-makes-strange-bedfellows/Mary-Matalin-and-James-Carville storyline has been done before. But maybe not for teens. And what really makes this particular version a fun read is one character, Katie. Her political interests make her an over-the-top, abnormal teen. While Drew is "nice," as Katie describes him, she's a happy misfit. She's too much a part of the adult political world for her to fit in at her private school, even though she is wealthy and connected to power. (Hmm. Maybe those things don't matter in high school.) She's never had a boyfriend, she doesn't have friends, and she does not care. No "woe is me" teen angst for this girl. She's got a campaign to run! Katie reminded me of Alison on Orphan Black, except for, you know, the drugs, alcohol, and being a clone. Who doesn't love Alison? The course of true love can't run smooth and misunderstandings drive Katie and Drew apart. Oh, my gosh. Am I getting a Pride and Prejudice vibe here? As an adult, I think Drew was way out of line, and Katie should move on. But that's years of experience talking. I hope this book is finding an audience this summer. And oh, how I wish the cover showed Katie in one of her red Nancy Reagan suits. 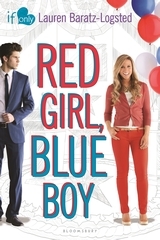 Red Girl, Blue Boy is part of the What If romance series published by Bloomsbury. While the books are standalones, they are linked thematically. The books are supposed to provide a "What If" situation (What if both presidential candidates had teenage children and they started dating? ), contain humor to some degree, and be appropriate for readers as young as twelve. FTC Info: As I said earlier, I do know this author. However, I got this book at a local library.